Here, a protocol to isolate and establish primary fibroblast/myofibroblast (MF) cultures from frozen gastric, small intestinal, and colonic tissue-yielding cells with a MF phenotype-is presented. These cells express CD90, α-SMA and vimentin. MFs can be used for a variety of functional assays including enzymatic activity and cytokine production. Johnson, P., Beswick, E. J., Chao, C., Powell, D. W., Hellmich, M. R., Pinchuk, I. V. Isolation of CD 90+ Fibroblast/Myofibroblasts from Human Frozen Gastrointestinal Specimens. J. Vis. Exp. (107), e53691, doi:10.3791/53691 (2016). 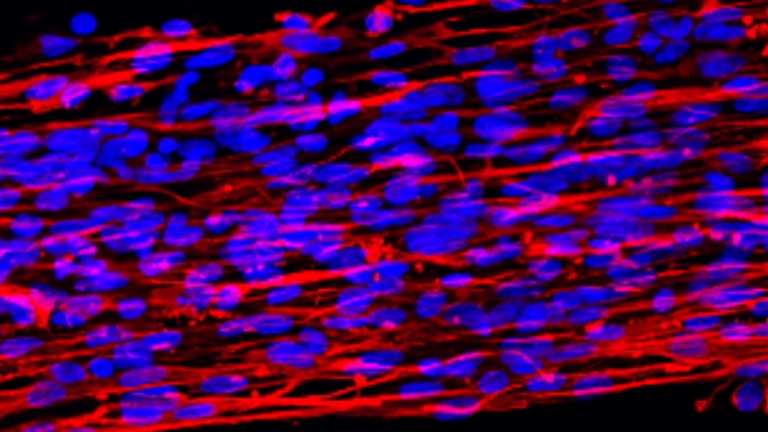 Fibroblasts/myofibroblasts (MFs) have been gaining increasing attention for their role in pathogenesis and their contributions to both wound healing and promotion of the tumor microenvironment. While there are currently many techniques for the isolation of MFs from gastrointestinal (GI) tissues, this protocol introduces a novel element of isolation of these stromal cells from frozen tissue. Freezing GI tissue specimens not only allows the researcher to acquire samples from worldwide collaborators, biobanks, and commercial vendors, it also permits the delayed processing of fresh samples. The described protocol will consistently yield characteristic spindle-shaped cells with the MF phenotype that express the markers CD90, α-SMA and vimentin. As these cells are derived from patient samples, the use of primary cells also confers the benefit of closely mimicking MFs from disease states-namely cancer and inflammatory bowel diseases. This technique has been validated in gastric, small bowel, and colonic MF primary culture generation. Primary MF cultures can be used in a vast array of experiments over a number of passage and their purity assessed by both immunocytochemistry and flow cytometry analysis. Myofibroblasts/fibroblasts (MFs) represent an abundant population of cells in gastrointestinal (GI) mucosa. These stromal cells are located just beneath the epithelium and form an interconnected network within mucosal lamina propria in the gut. MFs are not only responsible for the deposition of the extracellular matrix, but through paracrine regulation may influence electrolyte transport, restitution, and barrier function of the adjacent epithelium1, 2. Furthermore, MFs have been shown to play a key role in inflammation and tissue remodeling3, 4. Myofibroblasts are a critical part of the tumor microenvironment, where they are also known as cancer-associated fibroblasts, and contribute to the tumor cell growth and serve as a niche for cancer stem cells3. Emerging data suggests that MFs may also serve as local antigen presenting cells. Additionally, MFs function as important regulators of innate and adaptive immune responses, producing a variety of cytokines and growth factors5. In healthy individuals, MFs cells are believed to differentiate from mesenchymal stem cells and express on their cell surface, the mesenchymal marker, CD903, 5. These cells are also positive for vimentin, but negative for epithelial and hematopoietic cell marker, EpCAM and CD45, respectively. Myofibroblasts are suggested to be an activated form of fibroblasts and can be distinguished from non-activated fibroblasts by the expression of α-SMA5. Over the past decade, multiple approaches for the isolation of myofibroblasts from human colonic mucosa have been published-mostly based on the method originally described by Mahida et al.5-8. While individual studies report isolation procedures from various gut mucosa, no universal protocol for the isolation of MFs from multiple areas of the GI tract (i.e., gastric, small and large intestinal mucosa) has been published. The protocol presented herein has been tested and successfully used for all three type of tissue mentioned above. . Furthermore, procedures for isolating MFs from frozen GI mucosa have not been reported. Here, we present an optimized method, which is based on enzymatic digestion, and concurrently allows for the isolation of human gut mucosal MFs for culture and flow cytometry analysis in freshly-digested, single cell, mucosal preparations. This technique reliably yields primary cultures with an MF phenotype. Furthermore, the same methods can be used to isolate MFs from frozen specimens of gastric and small intestinal tissues as well. Isolation of myofibroblasts from fresh GI tissue has been previously described; however, the utilization of frozen specimens presents many benefits. Namely, researchers would be able to collect and store tissues from any number of collaborators across the world who have the capability to ship frozen tissue samples. Moreover, researchers may find the collection of discarded tissue from the operating room and/or endoscopy suite and immediate processing the tissue for isolation to conflict with their current experimentation schedule. Also, due to the unpredictable nature of surgery, tissue procurement may occur very late in the day, which will limit the time left for processing tissue. Freezing tissue for later processing will ameliorate these challenges. Lastly, these methods have been successfully utilized in the isolation of colonic, gastric and small intestinal myofibroblasts in disease states such as colorectal carcinoma and inflammatory bowel diseases. The protocol for obtaining discarded human tissue from surgical patients and the establishment of primary cultures was approved by the University of Texas Medical Branch and University of New Mexico Institutional Review Boards. The general requirements for the procurement of human tissue specimens is described below. Note that since MFs may be isolated from frozen tissue, biobanks and commercial vendors are also viable options. Submit a protocol to obtain human colon tissue to the institutional review board for approval. Establish collaborations with general surgeons and/or colorectal surgeons in order to obtain human tissue for research. Collaboration with the pathology department is also mandatory as they will be determining the tissue that is not required for diagnosis and may be designated for research. Advise the pathologist to provide tissue from the neoplasm and then grossly normal mucosa at least 5 cm from the tumor. Immediately place the samples in ice-cold wash media and place on ice. The pathologist will determine the amount of tissue that can be safely given for research. The minimal tissue required for MF isolation is 1.5 mm2. Use the obtained tissue either immediately to establish the primary cultures or freeze and place at -80 °C for future isolation. If freezing for later isolation, cut the tissue into approximately 1 - 2 mm2 pieces, place into a cryogenic tube with 1 ml of freeze media (see below), and store at -80 °C. Note: Utilizing this protocol, successful isolation of MFs from tissue frozen for over 4 years has been observed. For Collagenase solution: Prepare 100 U/ml collagenase I, II and IV in Hank's balanced salt solution (HBSS) with Ca2+/Mg2+ (see Materials Table). CAUTION: Collagenase active unit concentration and purity may varies from vendor to vendor, which may impede the efficiency of the tissue digestion and/or preservation of the epitope on the mucosal cell surface. To prevent these potential pitfalls, use collagenase with highest degree of purity (≥95%) and prepare the stock solution based on the active units concentration. Prepare Water-based DNase stock solution at 10 mg/ml (3.55 UA/mg). Prepare Freeze media: Fibroblast growth media (Reagent 2.4) with the addition of 10% Dimethyl Sulfoxide (DMSO), then filter-sterilize with a 0.22 µm filter. If the tissue was frozen in freeze media, place cryovial in warm (~ 37 °C) water until tissue and media is thawed. For 4 - 5 of 2 mm2 pieces of tissue, wash tissue twice with 10 ml of HBSS without Ca2+/Mg2+. Once tissue has settled by gravity, carefully discard the supernatant without spinning sample. Add 10 ml of the collagenase solution to the sample and transfer the tissue-solution mixture into a sterile, DNase/RNase-free tube with built-in rotors for sample dissociation. Use collagenase to dissociate the extracellular matrix which surrounds the basal aspect of epithelial cells and forms the non-cellular fraction of the mucosal lamina propria. Tightly close tube and attach it upside down onto the sleeve of the dissociator (e.g., GentleMACs). If the lab does not have the access to the aforementioned equipment, increase the time of each digestion step to obtain comparable results. Run the Program h_tumor_01, a pre-set profile included with the machine (total duration of 36 sec, with intermittent pulses ranging from 1,000 - 4,000 rpm, with 268 rounds per run). After termination of the program, detach tube from the dissociator. Incubate sample for 45 min at 37 °C under continuous rotation on shaker at 140 rpm. Note: For varying amounts of tissue samples, time of digestion can be proportionally reduced or increased (i.e., larger amounts of tissue may require additional time). Attach tube upside down onto the sleeve of the dissociator. Choose and run the Program h_tumor_02 (total duration of 37 sec, with intermittent pulses ranging from 1,000 - 4,000 rpm, with 235 rounds per run). Add 50 µl of DNase stock solution. Use DNAse to dissociate/remove dead cells and DNA fraction of cellular debris that leads to cell clumping. Incubate sample for 30 min at 37 °C under continuous rotation on shaker at 60 rpm. Attach tube upside down onto the sleeve of the dissociator again. Choose and run the Program h_tumor_03 (total duration of 37 sec, with intermittent pulses ranging from 1,000 - 4,000 rpm, with 168 rounds per run). Note: If the tissue is not completely digested, centrifuge at 250 × g for 10 min at 20 °C, discard supernatant, resuspend in 2 ml of cell dissociation solution and incubate at RT for 10 min. Pass the cell suspension through sterile 70 µm cell strainer. Centrifuge cell suspension at 250 × g for 10 min at 20 °C. Aspirate supernatant completely. Wash cell pellet twice with 25 ml of HBSS without Ca2+/Mg2+ and discard the supernatant. Prior to the last wash, count cell number using an automated cell counting system available in the laboratory or manually using hemocytometer. For MF primary culture generation proceed for step 3.19.1, for the analysis or sorting of MFs using flow cytometry proceed for step 3.19.2. For isolation and growth of pure MF culture (Figure 1), discard the supernatant from last centrifugation, resuspend cell pellet in the appropriate amount of fibroblast isolation media needed to seed up to 4 x 106 cells in 3 ml of the media per well in 6 well, cell culture-treated plates. Proceed to step 3.20. For the analysis or sorting of MFs using flow cytometry, place up to 2 x 106 in 2 ml of fibroblast isolation media in 24 well, low-binding plate and incubate O/N at 37 °C with 5% CO2. This is to restore the cell surface epitopes that may be affected by the enzymatic procedure. Then collect cell suspension and count recovered cells and proceed for the immunostaining and flow cytometry analysis8. Grow cells at 37 °C with 5% CO2. Change media every 2 - 3 days until formation of ~ 80% confluent MF monolayer (Figure 1D-E). 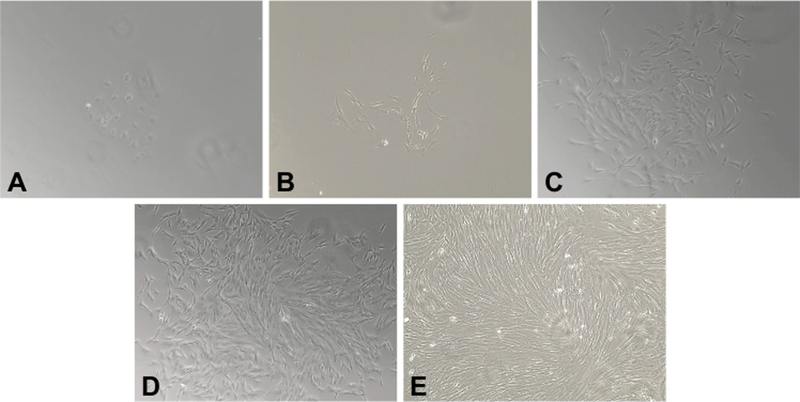 Passage cells in T25 flasks with from 6 well plate at ratio 1:1 and grow for ~ 10 - 14 days in fibroblast growth media to achieve 80 - 100% confluency. Expand culture by passaging cells from T25 to T75 cells at ratio 1:2. Once cells reach confluency, use one flask for the analysis of isolated MF purity using by flow cytometry as described previously5. Freeze or passage another T75 flask of MF culture at ratio 1:3. Note: When analyzed by flow cytometry, it is expected that GI mucosa stromal MF of mesenchymal origin when growing in culture will have following phenotype: EpCAM-, CD31-, CD45-, vimentin+, α-SMA+, CD90+. Using this enzymatic digestion protocol, we have consistently been able to isolate and grow MF population gut CD90+ mucosal stromal cells from GI surgical specimens and biopsies (Figure 1). Visible MF colony proliferation could be observed on day 2 - 5 after seeding mononuclear cell suspensions into 6 well plates (Figure 1A-B). The MF primary cultures reach ~ 50 - 70 % confluence by day 7 - 11 (Figure 1C-D). Figure 1. Primary Myofibroblasts (MFs) Isolated from Frozen Gastrointestinal Tissue. A 20X magnification of human MFs isolated from frozen specimen of human colonic mucosa. (A) Day 2. Adherent clusters of stromal cells are present. (B) Days 4. The characteristic spindle- or stellate-cell morphology has developed and is readily apparent. The density of fibroblast continue to increase on (C) Day 7 and (D) Day 10. (E) By Day 14, there is a completely confluent monolayer of MFs. Please click here to view a larger version of this figure. There is a slight decrease in viability of mucosal single cell preparation upon the freezing of surgical specimens (~10%, Table 1). However, with freezing, there is also a decrease in the bacterial/fungal contamination of the tissue observed and consequently, an increase in the efficiency of the MF culture generation. *Viability as determined by automated cell counter following 0.4% trypan blue solution staining. Table 1. Viability and Efficiency of Myofibroblast Recovery. Fresh vs. Frozen Tissues. The purity of generated MF culture was analyzed after cells were propagated at least for two passages, in order to ensure no contamination by other mucosal cells. Using confocal microscopy, it was demonstrated that MFs were positive for the marker of the mesenchymal cell lineage CD90 and vimentin, and also α-SMA, a marker of the differentiated mesenchymal cells (Figure 2). Figure 2. Isolated Cells Have Fibroblast Shape and Express MF Markers. Immunostaining of isolated MF monolayer, passaged at least two times in culture were fixed with 1% paraformaldehyde, immunostained and analyzed by confocal microscopy as described previously9. Isolated cells expressed a marker of myofibroblast, a-SMA (in green, as detected by murine mAb clone 1A4), and mesenchymal markers: vimentin (in red, as detected by mAb, clone RV202) and CD90 (in blue, as detected by murine mAb, clone 5E10). In the merged image, orange/yellow cells represent co-localization of a-SMA and vimentin; purple represents co-localization of vimentin and CD90. Please click here to view a larger version of this figure. This data was confirmed by flow cytometry analysis (Figure 3). As previously reported, normal MFs isolated from GI mucosa also were negative for hematopoietic makers CD45 and CD31, as well as epithelial marker, EpCAM3, 5, 9. Figure 3. Phenotypic Characterization of Primary Myofibroblast (MF) Cultures. Studies were performed on primary MFs isolated from colonic mucosa and passaged at least two time in culture. 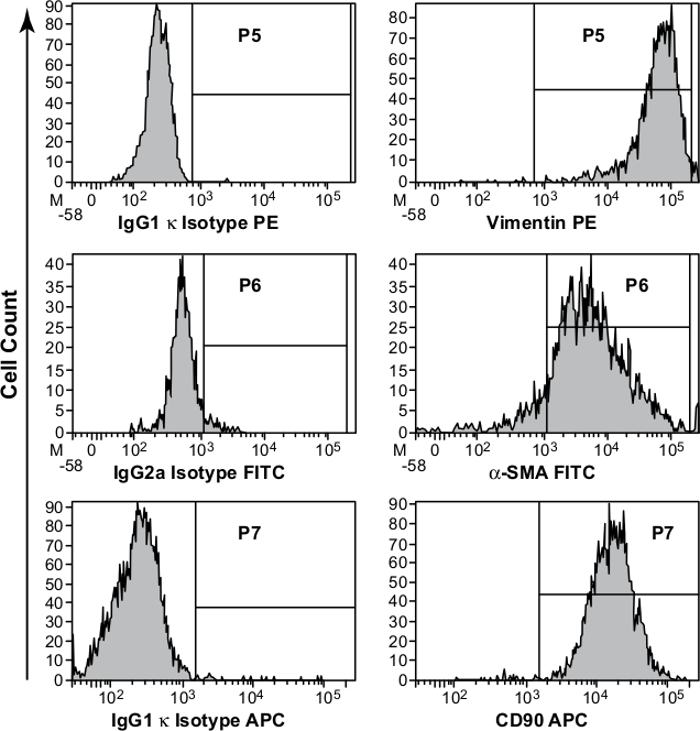 Immunostaining, followed by flow cytometry analysis, confirmed that the isolated cells have MF phenotype are uniformly positive for vimentin, α-SMA, and CD90. Appropriate isotype controls were included in the study. Please click here to view a larger version of this figure. While this protocol was developed for the research application only, in the light of growing critical importance of stromal cells as a potential cancer prognostic biomarkers and therapeutic target, the ability to freeze "functional" biospecimens for later use offers a significant advantage. This represents a unique advantage for creation of clinical biorepository, which may serve as additional tools serving to advance the development of personalized medicine10, 11. Similar to findings previously reported for adipose-derived mesenchymal stem cells isolated from frozen stromal vascular fraction, we did not observed any significant changes in the markers and proliferative/immune/inflammatory responses and metabolic activity of MFs isolated from frozen mucosal specimens.12 However, we do not exclude that some of non-tested responses such as extracellular marker deposition, etc. may vary. Thus, in those cases of working with unknown/unreported events, investigators may set up a comparison experiment in which the particular function will be tested side-by-side in MFs isolated from frozen and fresh tissue of the same individual. The majority of the techniques for myofibroblast isolation methods are based either on the use of mechanical mincing of the tissue combined with treatment either with chelating agents [ethylenediaminetetraacetic acid (EDTA), DL-Dithiothreitol (DTT)] or collagenolytic and proteolytic enzymes13-14. It was previously reported that generation of MF from stomach, small intestine and colon was efficient by using the outgrowth method initially described by Mahida et al, which is based on mechanical mincing and application of the chelating agents5, 6. Here, an additional enzymatic method that allows the generation of primary cultures of the MFs from frozen tissue specimens is reported. While both techniques-outgrowth and enzymatic digestion-are equally efficacious in the isolation of primary myofibroblasts from gastric, small intestinal, and colonic tissue, there is still debate within scientific community on whether cultured cells preserve their in vivo phenotype. The technique reported in this manuscript allows for not only generation of primary MF culture, but also permits ex vivo analysis of different cell populations presented in GI mucosa15-17. This includes determining their relative abundance with the tissue and the markers they express, but also for use in functional assays (e.g., enzymatic activity or cytokine production). Relative abundance of MFs within the tissue can be assessed using FACS by sorting the cells based on markers unique to MFs (namely, EpCAM-, CD31-, CD45-, vimentin+, α-SMA+, CD90+) and quantifying their presence when compared to a total of all freshly isolated cells or, if need be, by doing comparative ratio with a distinct cell types. Despite the efficacy of viable cell isolation, a noteworthy limitation of this and other protocols based on enzymatic digestion is that the proteolytic activity of enzyme employed may alter cell surface epitopes. To overcome this, we allow cells to recover O/N in order for epitopes to be re-expressed similarly to their predigested state. We have been able to consistently generate MF culture from frozen tissue with minimal loss of cell viability. The ability to recover these cultures from frozen specimen allows the researchers to manipulate and better preserve surgical and/or endoscopic tissue specimens obtained during the night or out of regular work-hours. Moreover, the decrease in the loss of procured, usable tissue due to the bacterial and/or fungal contaminants during the freezing process serves as an additional advantage. Following isolation, antibiotic use should be confined to only the first 2 - 3 passages, after which culturing should continue using standard aseptic technique and anti-mycotic/anti-mycoplasma agent-free media. Routine use of these agents in cellular culture has been shown to exert cytoxic effects, namely cell growth, cellular degeneration, and on occasion, death18. Enzymatic digestion will yield multiple cell populations present in the GI lamina propria including: immune cells, epithelial cells, and MFs. After the first passage, only MFs will remain and can be identified by their unique phenotype (Figure 1), as well as through cell-specific panel of marker analysis (CD90, a-SMA, and vimentin positive, but negative for epithelial and hematopoietic markers)3, 5, 9. While it is widely accepted that myofibroblasts arise from mesenchymal stem cells in the normal host, in disease states such as chronic inflammation and cancer, a subpopulation of MFs has been shown express epithelial or hematopoietic markers3. These findings have been suggested to possibly be a result of epithelial-mesenchymal transition (EMT) or recruitment of fibrocytes derived from hematopoietic lineage3, 19. Further, additional caution should be used if cells are immunostained and analyzed by flow cytometry for the markers discussed above. While we have not found the epitope loss to be an issue after allowing the cells to recover O/N from freshly digested tissue incubated in non-adherent plates, the loss of epitopes can occurs when using trypsin or any other proteolytic enzyme during the detachment of cells from the plate. Thus, to avoid this issue, we recommend to use of a cell dissociation solution with chelating agents such as EDTA when adherent MF cultures are intended for the immunostaining followed by flow cytometry analysis. After a primary culture of myofibroblasts is established, the cells can then be frozen in freeze media and stored in liquid nitrogen. These cells can be used in an array of in vitro experiments until approximately 14 - 15 passages, after which time the cells senesce and should be discarded. This work was supported by National Institute of Health (1R01DK103150-01A1, T32 DK007639, R01CA175803, K08CA125209) and the Institute for Translational Sciences at the University of Texas Medical Branch, and a Clinical and Translational Science Award (8UL1TR000071). Yamaguchi, H., et al. Stromal Fibroblasts Mediate Extracellular Matrix Remodeling and Invasion of Scirrhous Gastric Carcinoma Cells. PLoS ONE. 9, e85485 (2014). Mullan, N., Hughes, K. R., Mahida, Y. R. Primary Human Colonic Myofibroblasts Are Resistant to Clostridium difficile Toxin A-Induced, but Not Toxin B-Induced, Cell Death. Infect Immun. 79, 1623-1630 (2011). Powell, D. W., Pinchuk, I. V., Saada, J. I., Chen, X., Mifflin, R. C. Mesenchymal Cells of the Intestinal Lamina Propria. Annu Rev Physiol. Annu Rev Physiol . 73, 213-237 (2011). Latella, G., Sferra, R., Speca, S., Vetuschi, A., Gaudio, E. Can we prevent, reduce or reverse intestinal fibrosis in IBD? Eur Rev Med Pharmacol Sci. 17, 1283-1304 (2013). Saada, J. I., et al. Subepithelial myofibroblasts are novel nonprofessional APCs in the human colonic mucosa. J. Immunol. 177, 5968-5979 (2006). Mahida, Y. R., et al. Adult human colonic subepithelial myofibroblasts express extracellular matrix proteins and cyclooxygenase-1 and -2. Am J Physiol. 273, G1341-G1348 (1997). Roncoroni, L., et al. Isolation and culture of fibroblasts from endoscopic duodenal biopsies of celiac patients. J Transl Med. 7, (40), (2009). Pinchuk, I. V., et al. Stromal Cells Induce Th17 during Helicobacter pylori Infection and in the Gastric Tumor Microenvironment. PLoS ONE. 8, e53798 (2013). Pinchuk, I. V., et al. Monocyte chemoattractant protein-1 production by intestinal myofibroblasts in response to staphylococcal enterotoxin a: relevance to staphylococcal enterotoxigenic disease. J. Immunol. 178, 8097-8106 (2007). Paulsson, J., Micke, P. Prognostic relevance of cancer-associated fibroblasts in human cancer. Sem Cancer Biol. 25, 61-68 (2014). Valcz, G., Sipos, F., Tulassay, Z., Molnar, B., Yagi, Y. Importance of carcinoma-associated fibroblast-derived proteins in clinical oncology. J. Clin. Pathol. 67, 1026-1031 (2014). Minonzio, G., et al. Frozen adipose-derived mesenchymal stem cells maintain high capability to grow and differentiate. Cryobiology. 69, 211-216 (2014). Gargus, M., Niu, C., Shaker, A. Isolation of Myofibroblasts from Mouse and Human Esophagus. J. Vis. Exp. (95), e52215 (2015). Khalil, H., Nie, W., Edwards, R. A., Yoo, J. Isolation of primary myofibroblasts from mouse and human colon tissue. J. Vis. Exp. (80), e50611 (2013). Schiller, J. H., Bittner, G. Loss of the Tumorigenic Phenotype with in Vitro, but not in Vivo, Passaging of a Novel Series of Human Bronchial Epithelial Cell Lines: Possible Role of an α5/β1-Integrin-Fibronectin Interaction. Cancer Res. 55, 6215-6221 (1995). Augello, A., Kurth, T. B., De Bari, C. Mesenchymal stem cells: a perspective from in vitro cultures to in vivo migration and niches. Eur Cell Mater. 20, 121-133 (2010). Meller, D., Pires, R. T. F., Tseng, S. C. G. Ex vivo preservation and expansion of human limbal epithelial stem cells on amniotic membrane cultures. Br J Ophthalmol. 86, 463-471 (2002). Kuhlmann, I. The prophylactic use of antibiotics in cell culture. Cytotechnology. 19, 95-105 (1995). Morris, K. T., Nofchissey, R. A., Pinchuk, I. V., Beswick, E. J. Chronic Macrophage Migration Inhibitory Factor Exposure Induces Mesenchymal Epithelial Transition and Promotes Gastric and Colon Cancers. PLoS ONE. 9, e98656 (2014).